Home App Database Android Reachability Cursor App, A blessing for users having tall Smartphones! Hundreds of new apps have been introduced daily for the Android platform. Some are created to solve a specific issue while some are just a revamped version of some existing application. Today we came across an amazing application known as “Reachability Cursor”. This app is specially developed for users who are using smartphones with tall displays. This thing even works better than the inbuilt one-handed mode on some devices. So without wasting a moment let’s know more about it. We all know that owning a smartphone with a bigger screen is a great feeling, it allows you to enjoy your videos, photos on a mammoth screen. But similar to a coin it also has two faces. Bigger display on a smartphone makes it very difficult to hold the device with proper grip and one-handed usage is simply not possible. Recently we’ve seen that how handsets like Galaxy Note 9, LG V40 ThinQ are revolutionizing the smartphone market with their humongous Displays. You can get a rough idea about the working of this app from the above-posted illustration. Reachability Cursor is available in both free and paid versions. Paid version works fine for most of the time but when it comes to the customization you need to migrate to the paid version. This application makes use of Accessibility capabilities of a device to provide swipe pad on the screen. 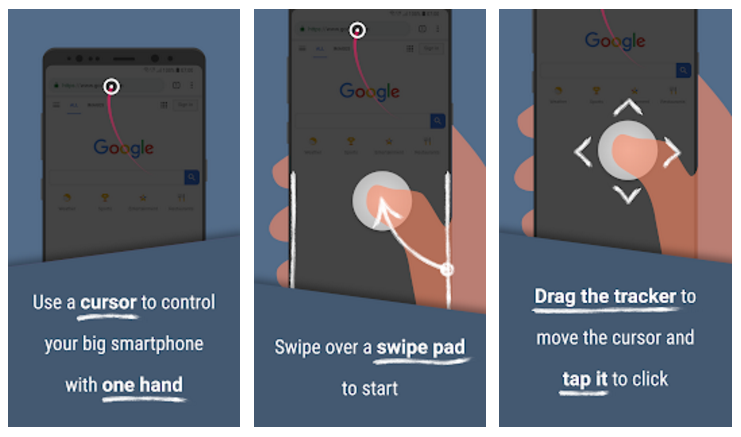 By controlling the pad you can easily control the cursor which works a virtual touch on your device. The application is available on Google Play Store and can be customized to adopt distinct users.